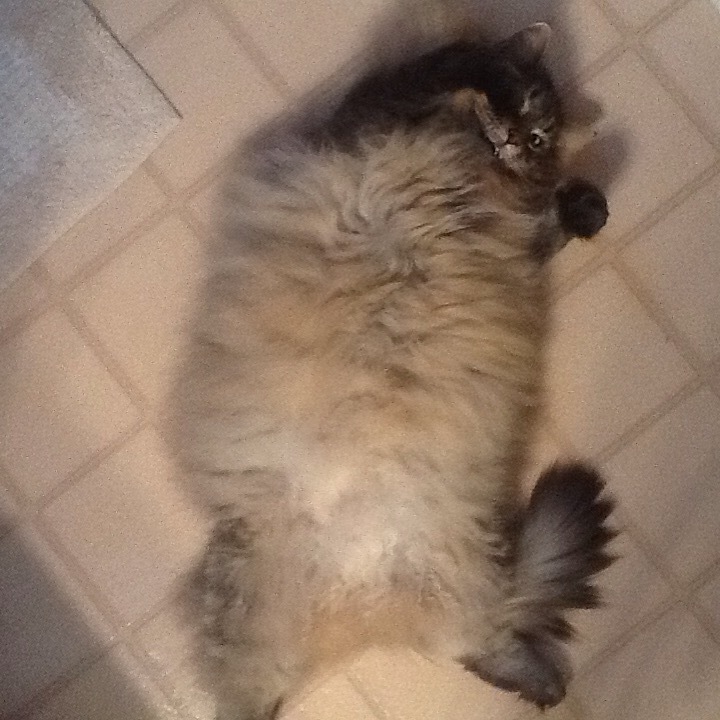 It is not uncommon when I am getting ready to start my day, that the bathroom floor is carpeted in furry creatures! In fact, it is a rarity for me to step out of the tub without the Romeo sprawled out on the bathmat and me performing some bizarre balancing ritual in an attempt to avoid treading on him! When I am pet sitting my kitty has competition! 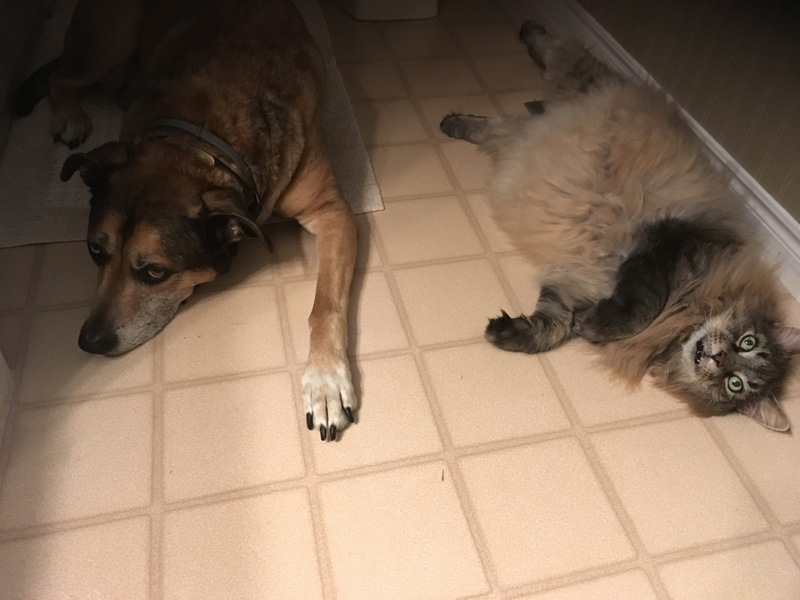 Sam, Newton, Harley…they all love to sprawl out on the linoleum and relax while I bathe and blow dry my hair! Our dog however, is not one to compete for space in the loo! The only time Lucas feels the need to frequent the washroom is when there is a thunder storm and he takes refuge in the empty bath tub. Occasionally, he will pop his head around the frame of the door to see if I am done my extremely limited beauty regimen! 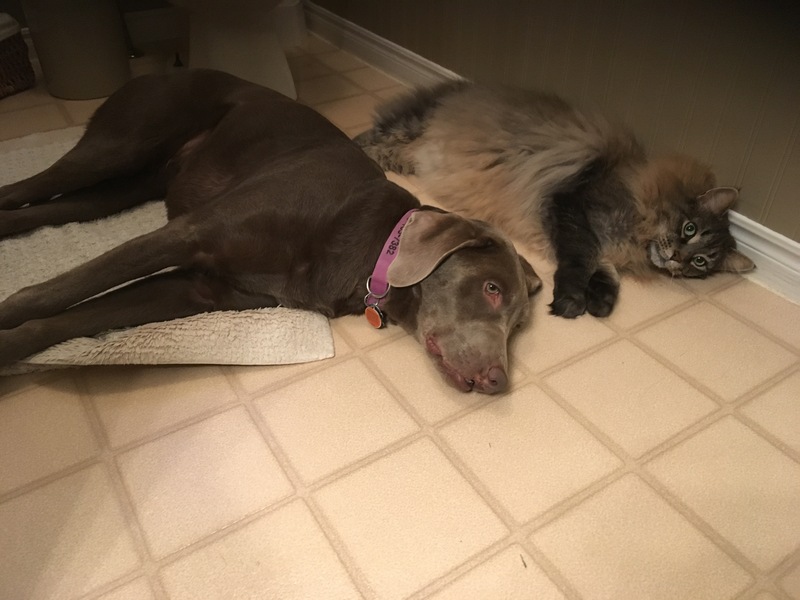 Imagine my surprise when I pulled back the shower curtain this morning to find my buddy Lucas lazing on the bath mat, relegating Romeo to lay over the vent! I was shocked when he didn’t grumble and shove off as I maneuvered stepping out, he occupied the entire surface of the mat, leaving me no option but to make a puddle on the floor. I figured his companionship would come to an abrupt end as soon as I began to blow dry my hair, but no…my sweet old love didn’t budge! He seemed quite content to rest and listen to Romeo’s very loud purring and the whir of my hair dryer. I found having both my furry boys hanging out with me to be splendid treat! I have been wondering as the day has progress if this will be the start of a new trend? Time will tell! Just in case it was a fluke, who knows, maybe he felt a pressure system coming on and I was thwarting his ability to find safe haven in his usual haunt, who knows! All I can say is that I am thrilled with myself that I decided to snap a photo before the adorable scene came to an end!